You'll rock this crazy-cute apron, perfect for almost any firm, medium to light weight fabric... try chambray, linen, denim, or of course, classic quilting cottons. The pretty ruffled trim can be done in the same or contrast fabric, or you can use a gorgeous purchased gathered lace trim. Retro-style apron has a classic semicircular skirt attached to a straight waistband-tie: skirt features heart-shaped patch pockets. 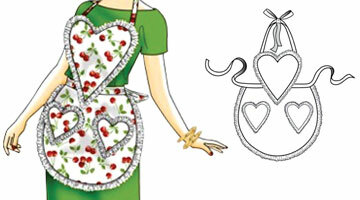 Heart-shaped bib is applied on top of the skirt, and ties at the back neck. Skirt, bib & pockets are trimmed with made or purchased trim. Wear this to host your next bake sale or tea-party... or make one of these as a sweetly pretty hostess or housewarming gift for your BFF. PLEASE NOTE: The newest version of Firefox may cause issues when downloading this pattern. If you cannot get the pattern file to open, please try accessing it in Internet Explorer.